A truly secure key management system should do more than just restrict key access. 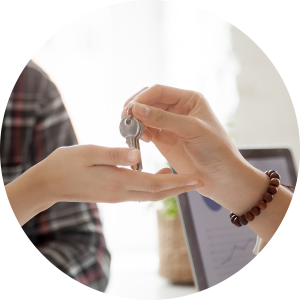 With a secure key management system like HandyTrac, key transactions are instantly noted and reported in numerous insightful formats for review. For added protection, secure key management systems implement multi-step verification procedures, allowing key access only to authorized users with preset PIN codes, access cards, and biometrics, depending on the model. If your needs grow, your key management system should have the ability to accommodate more keys. At HandyTrac we offer both single and double cabinet options for all our key management systems. A secure key management system should be easy to use and accommodating. HandyTrac key management systems are capable of storing a variety of keys, and offer user-friendly features including: biometric fingerprint verification, touch screen display and lighted cabinets. Additionally, through the use of HandyTrac Online, property managers can review key activity reports from any internet-enabled device. No matter how secure the key management system is designed to be, it’s not actually secure if it breaks down, or if you don’t receive proper training and support in using it. HandyTrac provides customers with an ironclad warranty, as well as ongoing training and support. Well designed key management systems make key control easy for all users. With three secure key management systems to choose from, HandyTrac systems offer a variety of features that streamline key management and provide maximum security. To learn more about our systems, contact us today.